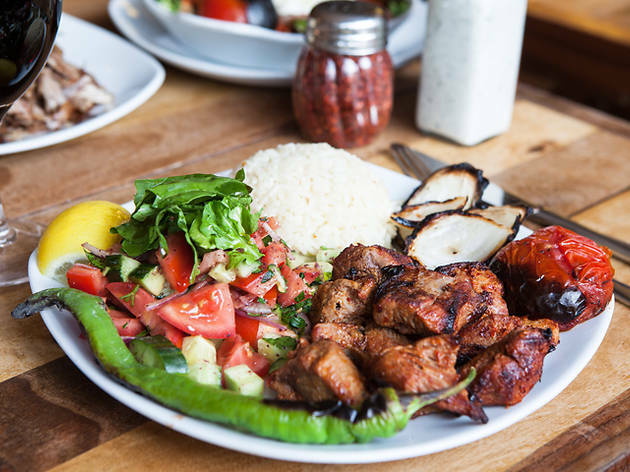 If you’re looking for the best Turkish food this side of Istanbul then go for a meander down Green Lanes. Once notorious for Turkish and Kurdish gangs and the drug trade – you can pack a pipe and scoff a pide – this corner of north London is one area that hasn’t yet had all of its edges sanded off. However, despite the fair share of negative press it has received, these days the only conflict you’ll witness is between hungry punters grappling for a table at one of the Lanes’ best eateries. Green Lanes runs for six miles from Newington Green to Palmers Green, but you’ll want to drop a pin in the section a third of the way down, near Harringay Green Lanes Station. Flanked either side by desirable Victorian terraces, this mile-long stretch, known as known as the Harringay Ladder, is a brilliant Turkish microcosm, complete with 24 hour greengrocers, awesome restaurants, beauty salons and social clubs, all operated by the local community. The tide of gentrification is slowly starting to creep in, injecting some much-needed cash into the area and some not-so-welcome spiralling house prices. But with its exuberant personality and culture, this is still one of the most unique and delectable streets in north London. Here’s hoping that the local community will stand its ground and that the rocket-fuel kahvesi and baklava won’t be completely replaced with cortados and avocados. Get your eyebrow game on fleek with Eser, the in-house beauty therapist at Mehmet’s who is an expert waxer, threader and facialist. Experience a close shave and let a barber (safely) set fire to your ears at Re-Style. This is more than a hot towel treatment. Don’t be put off by the unassuming facade of Harringay Snooker Club’s building. Clock in for a midnight session and feel like a naughty after-hours Steve Davis. The Salisbury is a stunning Victorian pub with cosy velvet-lined corners and obligatory taxidermy. Swig something malty from a wide selection of ales and lager, or learn to swing dance. Enjoy delicious gastro fry-ups and perfect Climpson and Sons’ coffee from Blend, a dinky, bright café. If you’re into Three Lions and all that jazz, then head to The Old Ale Emporium on match day for an authentic north London footy-pub experience. Yasar Halim is a butchers, greengrocers and bakery rolled into one. Get your mitts on börek, fluffy breads and giant cream cakes – not one for paleos. Head to Baldwins Butchers for some exquisite cuts of meat and the best fresh game in north London. Expect some banter in this family-run spot and choose from an array of sausages that would mystify even Lassie. Harringay Local Stores is owned by Pendulum’s El Hornet and specialises in local produce, craft beer, delicious bakes and vinyl – definitely not just another Tesco. Kofali Hot Nuts has been on the Lanes for over ten years now. Buy some by the kilo and be sure to try a slab of the nutty chocolate. Sod pizza, stuffed Turkish flatbreads is where it’s at. Head to Taksim Cafe and watch yours being freshly made with spinach and feta for a mere £2.50. Pop into the sweet side of restaurant Antepliler for tea and baklava, or get a box to take away. 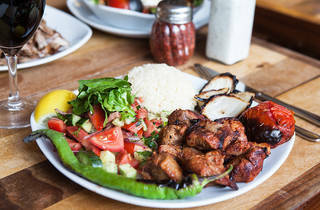 Go to Gökyüzü for a yoğurtlu adana kebab, or grab a group of your mates and go all-in on one of their mouthwateringly good meat platters. By Hayley Joyes, who never goes hungry in Harringay. Fancy a change of scene? Here are 11 reasons to go to Roman Road in Bethnal Green and Bow. Hayley is the digital producer for music, nightlife and theatre. She still believes what Karl Kennedy did to Susan was wrong and she'll never forgive him. Follow her on Twitter @HayleyJoyes. I've been going to Esers beauty for several years. It has a very welcoming atmosphere. Very helpful friendly providing her customers a professional service, great treatment and honest with her opinions.